On June 26th 2015 a large number of tourists were relaxing on the beach outside the deluxe Riu Imperial Marhaba Hotel in Port El Kantaoui, a tourist complex situated on the Tunisian coast. Blessed with almost continuous sunshine and warm temperatures the resort was particularly popular with sun starved visitors from Northern Europe. As revealed later from video surveillance footage, at around noon, a “student” named Seiffedine Razgui got out of a small van about a kilometer down the road along the coast. Seiffedine, who was carrying a beach umbrella, ambled slowly along the beach until he reached the main group of tourists outside the hotel. At this point he unwrapped the umbrella and took out a Kalashnikov automatic rifle. Slowly and methodically he then began to shoot and kill the people around him as he walked towards the hotel entrance. The massacre continued until he was finally shot dead by security forces outside the hotel. Thirty-eight people were killed, thirty of them British. Descriptions of these events related by the survivors were chilling. It was not only the fact of the murders that shocked people but the demeanor of the killer. According to several eyewitnesses Seiffedine smiled as he shot people and seemed to enjoy watching them as they squirmed in their death throes. Surely, even a man who was consumed by religious fervor and ecstasy couldn’t behave like this? Indeed, the situation eventually proved to be more complicated. During his autopsy Seiffedine was found to have been taking a powerful psychostimulant drug called fenethylline, sold under the trade name Captagon. He was certainly under the influence of the drug when he carried out the massacre. Of course, the idea that warriors and soldiers in battle might fortify themselves with various kinds of psychotropic drugs is not a new one. The Vikings were certainly rumored to do this. Ferocious Norsemen known as “berserkers” were thought to be under the influence of large amounts of alcohol at the very least, as well as hallucinogenic natural products including muscimol from the mushroom Amanita Muscaria or tropane alkaloids such as scopolamine and atropine from plants such as mandrake, henbane and deadly nightshade. Legend also has it that Hassan-i-Sabah, the “Old Man of the Mountains”, an 11th century Isma’ili warrior, recruited and trained an army of men to kill the invading infidel crusaders. He established a stronghold for his troops in the castle of Alamut high in the mountains of northwestern Persia. Here they were indoctrinated and trained as ferocious assassins. It is said that Hassan-i-Sabbah used hashish as a way of putting his acolytes into a state of trance so that they could carry out their work more easily. They became known as “Assassins” from the same root as the word “Hashashins” or “hashish users”. 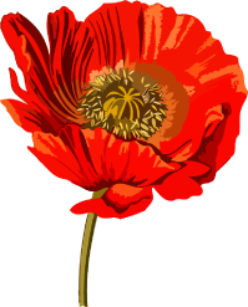 In the 20th century newly developed psychostimulant drugs were produced and were widely used during the Second World War by both the Allies and Axis armies. Primary among these were the amphetamines. When first produced in the USA amphetamine was sold under the trade name Benzedrine packaged as inhalers for use as a decongestant. They certainly worked but were soon found to have other interesting properties as well. The energizing effects of “bennies” could keep you awake and focused for several days on end. Soon Benzedrine was being supplied to US troops in the Far East. Taken at higher doses amphetamines can make you feel invincible, that there is no pain, no hunger and everything is fine. Just the way you would like a soldier to feel in the midst of combat. The Nazis used amphetamines as well, their version being a drug called Pervitin (methamphetamine). The drug was supplied to troops during “blitzkrieg” attacks when German armies swept through Western Europe and Russia, each attack moving forward at full tilt for several days on end while their soldiers remained awake and alert. Apparently Hitler was also given the drug by his doctors from time to time to keep him on top of things. However, the energizing effects of amphetamine like substances come with their own considerable problems. Exhaustion subsequent to coming down from the drug induced high and psychotic like effects that cloud one’s ability to make rational decisions aren’t ultimately things that help effective military performance. Now it appears that psychostimulants have been appropriated by groups such as ISIS for the purposes of what is being called “Pharmacoterrorism”. Just as somebody like Charles Manson would use drugs to help indoctrinate his followers, Middle Eastern terrorist groups are probably using them to help energize their recruits. It is widely thought that psychostimulant drugs, and Captagon in particular, were used by terrorists involved in the November 2015 Paris attacks, drug paraphernalia was found at the terrorists’ hideout, as well as other attacks throughout France, Germany and the United Kingdom. Commentators have speculated that the use of psychoactive drugs might help to explain some of the severity and callousness of the attacks. The idea that amphetamine like substances can produce psychotic like behavior is certainly not a new one. Indeed, the effects of amphetamine played an important role in the development of the first antipsychotic drugs for the successful treatment of schizophrenia. Screening new drugs usually requires an animal model of the disease in question for testing new substances as they are developed. In the 1970s, when I was a graduate student working on the properties of antipsychotic drugs like chlorpromazine and haloperidol, the major theory as to the cause of schizophrenia was that it involved a disruption of the neurons in the brain that use dopamine as their neurotransmitter. There are two major sets of dopamine utilizing nerves in the brain. One set of nerves arises from a nucleus in the midbrain named the Substantia Nigra (SN) and innervates the basal ganglia. These nerves are concerned with the control of movement. It is this nerve pathway that degenerates in Parkinson’s disease resulting in the lack of motor control which is the primary symptom of the disease. The second major group of dopamine nerves arises from the Ventral Tegmental Area (VTA) and innervates structures in the limbic system, an ancient part of the brain concerned in the regulation of fear and emotion. In the 1970s it was thought that hyperactivity of the dopaminergic nerves that innervated the limbic system might be the cause of many of the symptoms of schizophrenia. Hence, a related popular hypothesis was that effective antipsychotic drugs like chlorpromazine acted as antagonists of hyperactive dopaminergic neurons by blocking postsynaptic receptors for dopamine. One of the things that supported this idea was the fact that classical antipsychotic drugs could also produce Parkinsonian like symptoms in both humans and animals. In contrast, amphetamine like drugs enhance the release of dopamine from central dopaminergic neurons. This is achieved by interfering with the high affinity uptake system for dopamine in the terminals of these neurons and also by activating G-protein coupled receptors (GPCRs) for trace amines that also control dopamine release. Because amphetamines enhance central dopamine neurotransmission, one of the consequences of taking large doses of these drugs in some people is the development of psychotic behavior. Symptoms can include auditory and visual hallucinations, delusions of persecution and extreme psychoagitation which are considered to be some of the core symptoms of schizophrenia. Such observations were also taken as support for the dopaminergic theory of schizophrenia. Again, as a graduate student, I was told that when people turned up at the hospital emergency room suffering from amphetamine psychosis it was often initially impossible to tell whether they were suffering from the effects of high doses of amphetamine or acute paranoid schizophrenia. The scientific literature contains numerous reports of individuals who were misdiagnosed for several years in hospital, while all the time taking amphetamines surreptitiously. Given this argument it seemed reasonable to suppose the effects of amphetamine given to an animal like a rat would constitute an animal model of schizophrenia and would therefore be useful in developing new drugs. Amphetamine makes animals like rats and mice run around a lot and also engage in stereotyped digging and other behaviors. The prediction would be that substances that blocked such behaviors might be effective antipsychotic drugs in humans. Guided by this hypothesis, the pharmacologist Paul Janssen, who was head of the Janssen Pharmaceutica drug company in Belgium, used the behavioral effects of amphetamines in rats to develop haloperidol one of the most successful antipsychotic drugs ever produced. Given the fact that paranoid, delusional schizophrenic patients can sometimes behave in a violent manner, it is quite likely that the use of psychostimulants by terrorists might contribute to their behavior when they carry out deadly attacks. But what exactly is fenethylline (Captagon)? The drug was originally synthesized in the early 1960s by the German firm of Degussa AG, who also had the dubious distinction of being the company that synthesized all of the poisonous Zyklon B gas that Hitler used in concentration camp death chambers during World War II. The drug was synthesized as part of a program designed to discover derivatives of the anti-asthmatic drug theophylline that had an improved therapeutic profile. But fenethylline was soon found to have clear central stimulant activity as well, that couldn’t be explained solely on the basis of its theophylline like effects. Because of its psychostimulant properties the drug became a prescription-only, scheduled drug in Europe and was never actually used in the USA. However,it was quite widely employed in Europe in the 1960s and 1970s for the treatment of Attention Deficit Hyperactivity Disorder (ADHD), narcolepsy and depression. Fenethylline is what is known as a prodrug-that is an inactive substance that is broken down in the body to produce an active substance that is ultimately responsible for producing its effects. This is also the case with heroin, for example, which is broken down in vivo to produce morphine. In the case of fenethylline, the molecule consists of two parts, amphetamine and theophylline chemically attached to one another (Fig 1). Following administration, the drug is broken down into its component parts and so one obtains the effects of both theophylline and amphetamine simultaneously. We have touched on the properties of amphetamine above. Theophylline is a type of alkaloid known as a methylxanthine and is closely related in structure and properties to caffeine and theobromine (Fig 2). Like those two substances it is also found in a variety of modestly stimulating drinks including coffee, tea and chocolate. Methylxanthines produce a variety of effects on the central nervous system which help to increase wakefulness and alertness. They also produce peripheral effects such as relaxation of the lungs and stimulation of the heart. Historically, theophylline has been used for the treatment of asthma because of its bronchodilator (“lung relaxing”) effects. Methylxanthines have two major molecular targets. First of all, they act as antagonists of a family of G-protein coupled receptors (GPCRs) known as adenosine receptors. These receptors constitute a part of a very widely distributed intercellular signaling system based on the extracellular effects of adenosine triphosphate (ATP) and its metabolites, including adenosine. There are a very large number receptors ,of both the GPCR and ligand gated ion channel types,that mediate the effects of ATP and its metabolites. In the brain, for example, activation of adenosine receptors produces sleep. In the periphery activation of adenosine receptors has an inhibitory effect on cardiac function. Hence, drugs like theophylline and caffeine that block the effects adenosine have both CNS and cardiac stimulatory effects. The second molecular target for methylxanthines is that they inhibit the enzyme cyclic AMP phosphodiesterase which is responsible for destroying cyclic AMP –a universally important cellular signaling molecule. Hence, inhibition of the enzyme causes concentrations of cyclic AMP to rise inside cells. One major consequence of this is relaxation of the lungs. Following the realization that fenethylline was an effective psychostimulant, it rapidly became used as a street drug where it was sold under its commercial name, Captagon. It should be realized that from the chemical point of view Captagon is rather cheap and easy to manufacture. In the 1980s the drug started to be produced in underground laboratories in the Balkans and then moved from there to Turkey and then to the Middle East where it became a very popular recreational drug. Indeed, it has been estimated that between 40 and 50% of the drug abuse problems involving young men in Saudi Arabia are due to Captagon misuse. Nowadays, the vast majority of Captagon tablets are manufactured by laboratories in the Middle East. The drug has become part of an enormously complex black market. Literally millions of tablets have been traded on the Dark Web through sites such as AlphaBay, at least prior to its being closed down in July of this year. 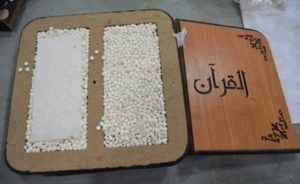 In 2013, 12.3 million Captagon pills were seized near the border between Lebanon and Syria. In 2014, 29.09 million Captagon-branded pills were seized in Dubai. The corruption goes up to the very highest levels of society. In October 2015 a Saudi Arabian prince and his “friends” were detained in Beirut in possession of two tons of Captagon tablets on board his private jet prior to taking off for Riyadh. However, the overall Captagon problem is not restricted to the fact that is abused by affluent young Saudis. It is quite clear that much of the black market trade is under the control of jihadists who use the profits they receive from trading Captagon for funding their arms purchases and other activities. Moreover, the drug is also given to terrorist soldiers for the age old purpose of energizing them during warfare, as discussed above. A recent report from a drug control officer in the Syrian city of Homs described the jihadist fighters under the influence of Captagon this way…”we would beat them and they wouldn’t feel the pain…many of them would laugh while we dealt them heavy blows.” In an interview with CNN a 19‐year‐old ISIS fighter said, “They gave us drugs; hallucinogenic pills that would make you go to battle not caring if you live or die”. It will come as no surprise that laboratory analysis of the “Captagon” tablets surfacing at points around the Middle East have shown that they are anything but a pure product. Although the counterfeit pills look like the real McCoy, including being embossed with the original Captagon motif, they usually contain a variety of substances in addition to fenethylliune. The adulterants that have been detected include, but are not limited to, pure amphetamine and methamphetamine, ephedrine, metronidazole, caffeine, theophylline, chlorphenamine, procaine, trimethoprim, chloroquine and quinine. Different adulterants have been detected in different batches of counterfeit drugs (Fig 3). Apart from highlighting the importance of Captagon in the rise of pharmacoterrorism, there are genuine questions about its mechanism of action. How exactly do its two major bioactive constituents, amphetamine and theophylline, interact to produce the ultimate effects of the drug? Are all of the effects of Captagon really due to these two substances or are there independent effects of the parent molecule itself? A recent paper in the prestigious scientific journal Nature* tried to answer this question using a novel approach. The authors of these studies began by repeating some well known observations on the effects of Captagon. For example, the drug made mice more energized, reflected by the fact they ran around a lot more. Secondly, Captagon made mice become more vigilant as assessed by a maze exploration task. Finally, mice treated with the drug found that they liked to spend more time in the part of an apparatus associated with receiving the drug –a behavior known as Conditioned Place Preference. This would be rather like an addict choosing to hang out at a bar where he would normally score drugs. The authors then made an antibody against Captagon which recognized not only the parent drug but also its two products, amphetamine and theophylline. An antibody is a protein that can detect and then bind to a specific substance and so remove it from the bloodstream. When this antibody was given to mice it was able to neutralize Captogen and any theophylline or amphetamine that was produced from it. Not surprisingly this treatment did a pretty good job in blocking all of the effects of the drug. 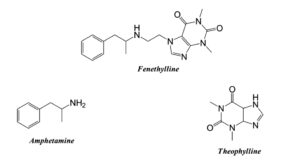 Now the authors made separate antibodies directed against amphetamine and theophylline. These antibodies specifically reacted with amphetamine or theophylline as well as Captagon. The authors then tested each antibody in mice treated with Captagon. They found that the antibody against amphetamine had a very marked effect on the different behaviors produced by the parent drug, whereas the effects of the theophylline antibody were much more limited. Following a detailed analysis of all of the results the authors came to the following conclusions. First of all, they concluded that Captagon itself was really devoid of any activity and its effects were due to its products, amphetamine and theophylline. Secondly, the major psychostimulant effects of Captagon were produced by amphetamine. However, they also demonstrated that theophylline had a “supportive” role, enhancing some of the effects of the amphetamine. Hence, Captagon had more extensive effects than just giving amphetamine by itself. The approach used in these experiments, using antibodies to dissect out the different effects of drugs, is a very interesting one and the authors suggest it may be applicable in the future to solving many other problems of this type. In the meantime, we can see that the use of Captagon/fenethylline is just one more example of easily synthesized psychoactive drugs getting out onto the streets. The chemical knowhow required to produce Captagon as well as super powerful opioids and cannabinoids is not that great and they can be illegally produced quite easily in underground laboratories in many countries. Dealing with their production and distribution now constitutes a very challenging law enforcement problem in our increasingly connected world. * Wenthur CJ, Zhou B and Janda KD. (2017) Vaccine driven pharmacodynamics dissection and mitigation of fenethylline psychoactivity Nature. vol 548, p476-479.